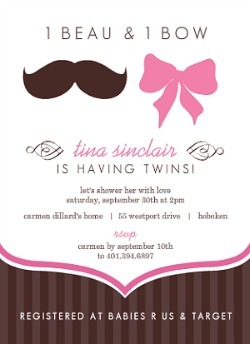 How to find the perfect invite 101: It has to fit the baby shower theme and your budget. That’s not always an easy combination! We’ll show you free, custom, handmade, affordable, and really unique baby shower invitations. guest list, RSVP responses and send notices, or updates if needed. print on colored card stock. This will help you save on your ink supply. THE BEST BUDGET TIP: Buddy up! there are better ways to plan an affordable party. Having two or more party hosts is extremely common and a great way to stretch your budget. Another idea: If you do shop custom invites, choose invitations that are post card style- or single sided, rather than a double fold to save on print and material cost. Watch for great sales and coupons. Make your own homemade card, or design it on your PC with really affordable images. Clipart.com has thousands of options for baby clip art. can also select FREE CLIPART from our main menu to learn more. 1. 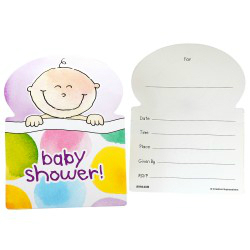 Hand-print your party information (fill-in cards). will be the only printing you will need to do.